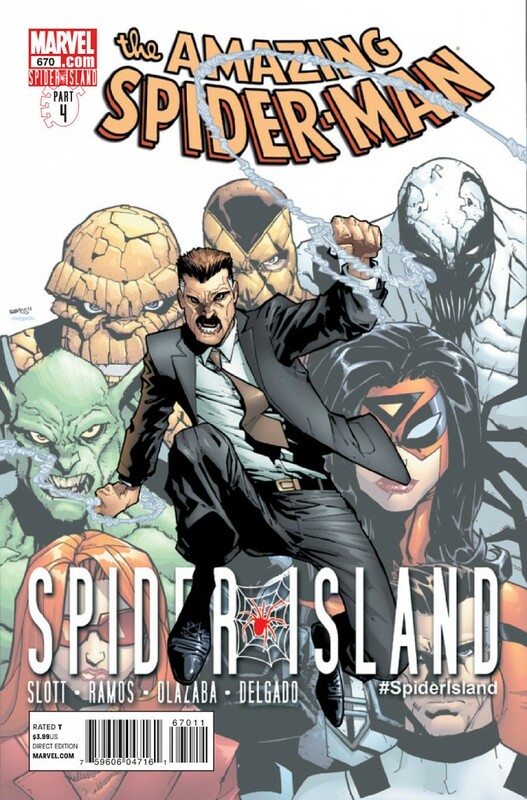 Good old J. Jonah Jameson, aka Jolly Jonah, has been such a critical part of the Spider-Man universe, really since day one, that it truly was inevitable that he was going to play a large part in Spider Island at some point during the arc. When I saw Humberto Ramos’ awesome cover for ASM #670, I was hoping this was going to be the issue where he would shine and after reading this issue I was happy to be right. Right off the bat, ASM writer Dan Slott does a good job tying together both everything that’s happened in previous Amazing Spider-Man issues and all of the various Spider Island tie-ins, such as the Avengers one-shot and Rick Remender’s Venom series. 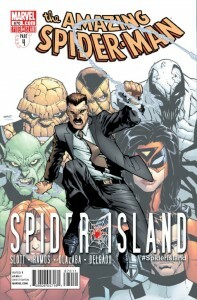 While it may seem like an obvious move when Marvel is pumping out about 20 additional comic books connecting to Spider Island, it still felt like a great reward for readers who have stuck with the arc through all of its twists and turns – discovering new characters, or rediscovering old ones – and picked up all those extra issues to see them getting referenced in the flagship title. And beyond a few clunkers, most of the tie-ins have been great reads, but I’m still incredibly pleased that Slott hasn’t overlooked their existence in Marvel’s canon. But that’s really more about form and process whereas the actual storyline for ASM #670, centered around Jameson’s simultaneously tragic and humorous descent into a spider creature, is where Slott really excels. In many ways, Jameson was Spider-Man’s first and arguably greatest foil. 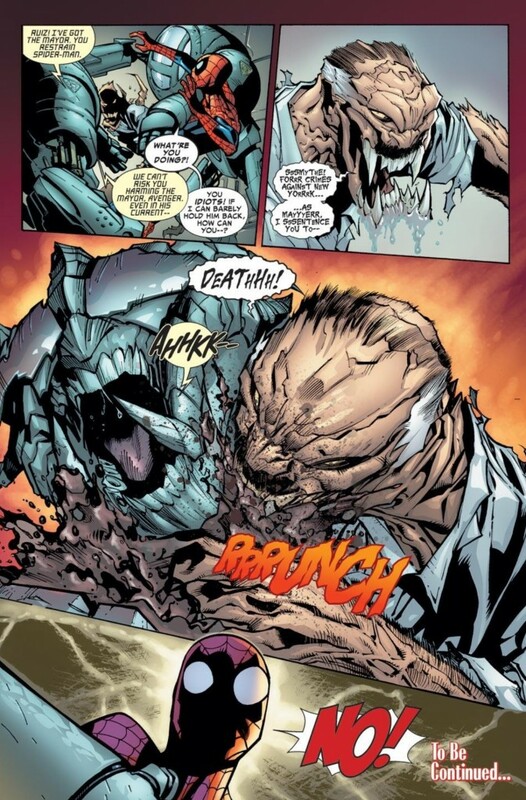 While Spidey was often physically challenged by supervillains like Green Goblin and Doctor Octopus, Jonah came to represent the one foe Spider-Man could never beat – public perception. 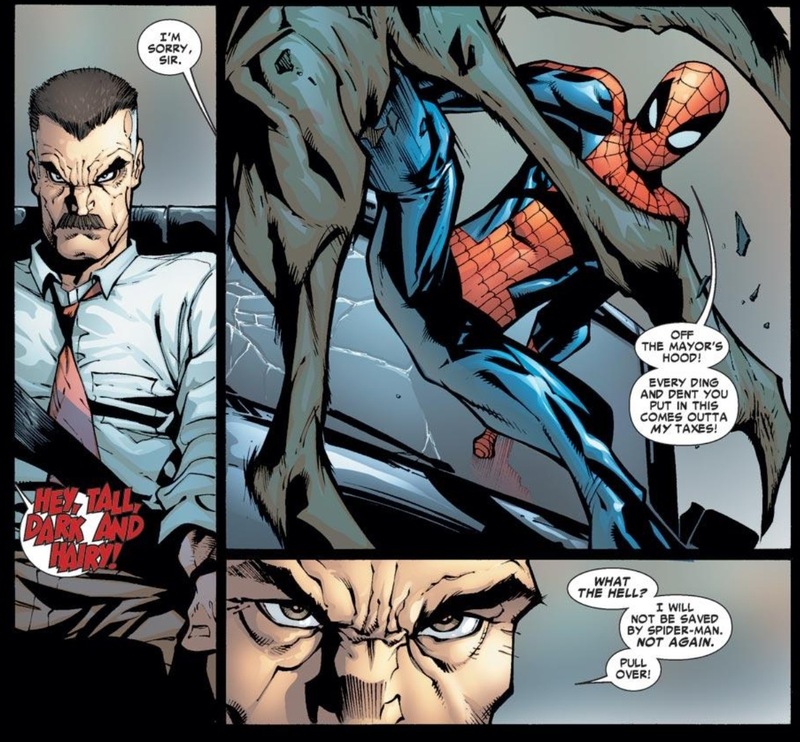 With Jameson controlling the Daily Bugle, and later as Mayor of New York City, he has routinely maintained the upper hand in his crusade against Spider-Man, even if he’s often been unsuccessful in subduing the web-slinger whenever he’s hired mercenaries like the Scorpion, the Spider Slayers, etc. to do his dirty work. Despite being a hero to New York, Spider-Man is still viewed by most average citizens as a masked threat who’s got “something to hide.” And you can thank Jameson for all of that. At the core, Jameson has been able to sway public opinion because he’s a charismatic personality who utilizes bluster and bombast very effectively. While he’s obnoxious and cruel to his employees, he’s always found a way to resonate with “the people.” Otherwise, he would never have maintained his grip on power for so long. And yet, Jameson is a human being with human emotions and failings. So while there are many instances where I’m sure Spider-Man would have loved to just punch him in the face, web him up, and leave him in a dumpster to rot somewhere, there’s something oddly sympathetic about the guy so Spidey can’t. His best bet is to just ignore him. Slott captures all of these Jameson/Spidey dynamics during Spider Island. The fact that New York City has been overrun with a virus that turns average citizens into “clones” of his mortal enemy – the fact that Jonah himself has been infected with this virus and HE now has the abilities and attributes of his mortal enemy – is just deliciously ironic. And yet Jameson still has a responsibility to uphold as mayor. He’s smartly quarantined the city so the virus doesn’t spread, yet is ready to cut a deal with Alistair Smythe and the Spider Slayers (who Spider-Man naturally reminds Jameson is the guy who killed his wife earlier this year), just shows what a conflicted mess this character is. 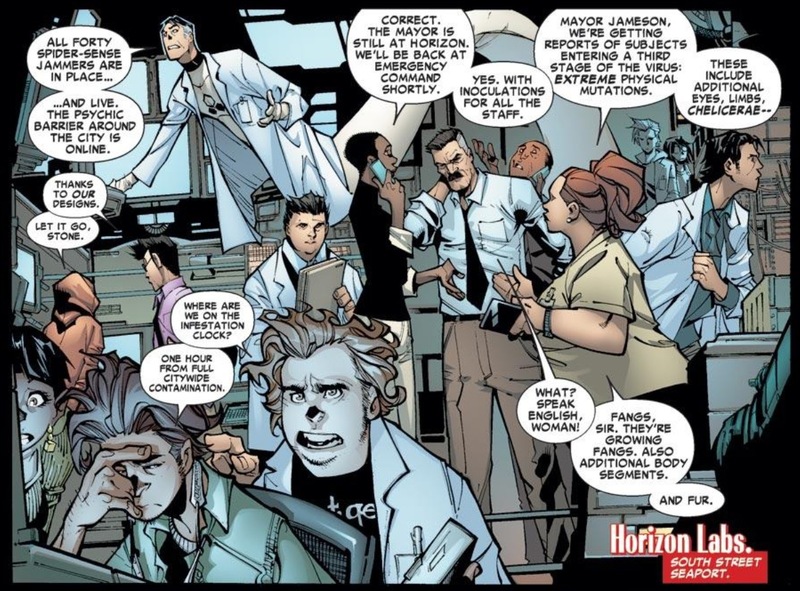 Jameson is also the only guy who can get away with insulting the scientific integrity of Reed Richards because he very passionately and sincerely wants to protect his city and destroy this spider virus. While trying to find a cure, Mr. Fantastic is only thinking about the well being of others. Jameson is thinking of others AND his own personal emotions. It actually ends up being pretty powerful stuff. Comical. And powerful. Jameson is just another component of a cast of characters that has consistently made Amazing Spider-Man one of the better reads (my obvious favorite) throughout comic book history. It’s one thing to be able to create and develop over-the-top, super-powered heroes and villains that capture imaginations and create credible conflict, but it’s quite another to integrate real human beings who are equally integral to the success of the overall series. As advocate for Peter Parker/Spider-Man, ASM has offered us Aunt May and Mary Jane, but as the continuous thorn in his side, nobody is better to read about than Jameson.